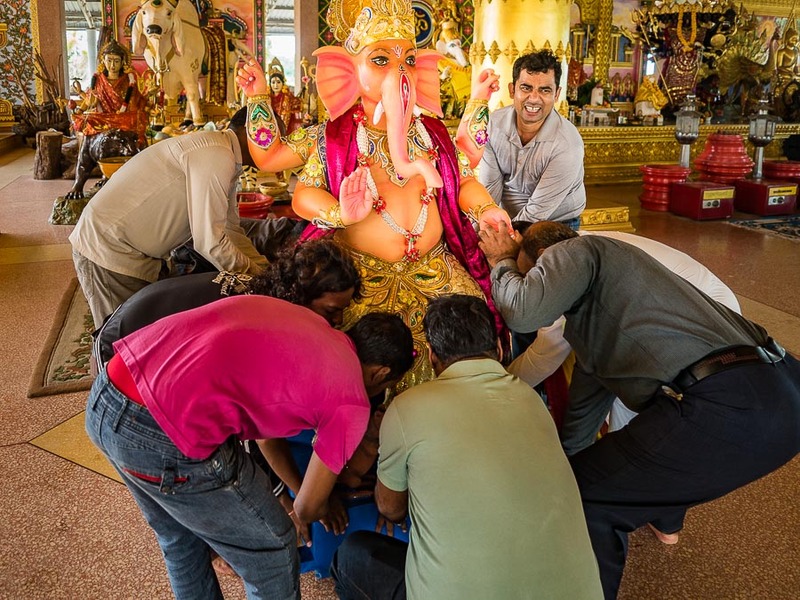 Men maneuver the Ganesh statue into place on the first day of the Ganesh Festival at the Shiva Temple in the Bangkok suburbs. 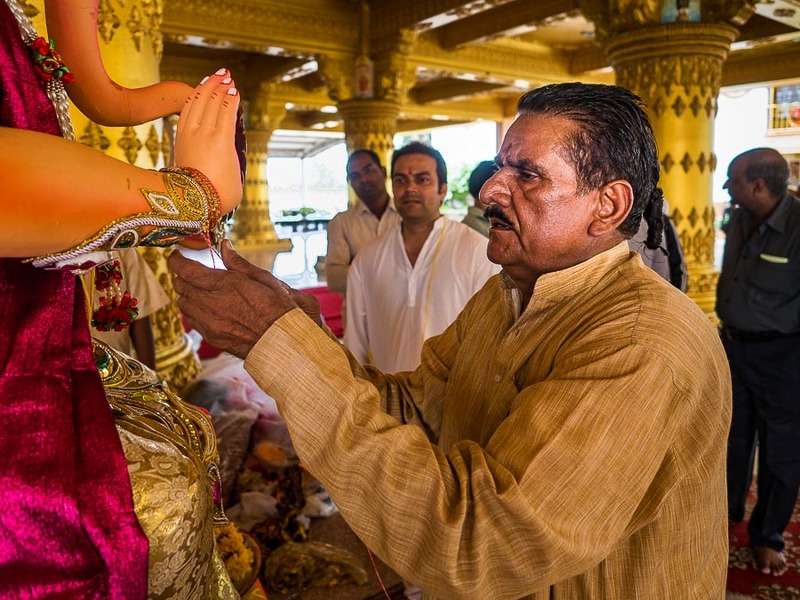 I covered the first day of the Ganesh Festival yesterday. 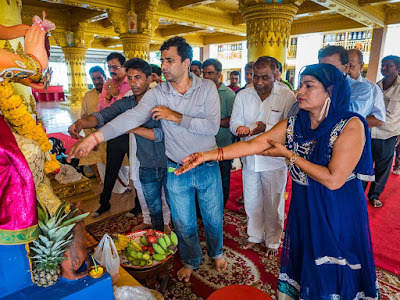 I went out to the Shiva Temple in a suburban community in eastern Bangkok. It's a remarkable temple that serves both Buddhists and Hindus. It's far from central Bangkok and well off the tourist trail. I've gone out there several times and never seen another tourist or visitor there. Men pray when the statue was delivered. It was a very small crowd at the temple. I've covered Ganesh here a couple of times and there were hundreds of people but this year there were only about 20 people at the temple. Most of the Bangkok Hindu community went up to the big Ganesh celebration in Nakhon Nayok (which I've also covered in the past). 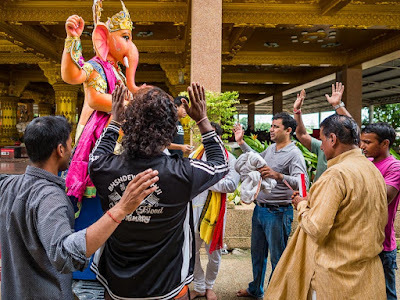 Men carried the statue of Ganesh into the prayer hall and a Hindu priest blessed the deity, there was a short prayer and people adjourned for lunch. ...The prayer service after the priest consecrated the statue. It was a short service - only about 30 minutes. When the service ended a couple of men invited me to join them for lunch. We had a very nice vegetarian meal of curry, rice and chapatis (a flat bread). It was a community meal, but since there were only a few people there it felt more like a family dinner. When lunch ended one of the men offered me a ride out to the main road where I flagged down a taxi and came home to edit. 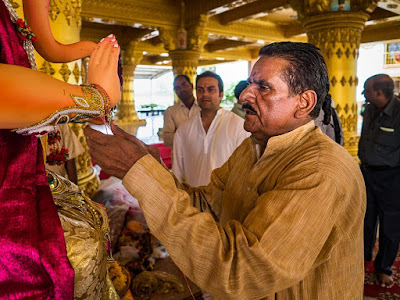 I won't be able to attend other Ganesh ceremonies this year. My time has been monopolized by the photography I've been doing at the Pom Mahakan Fort. 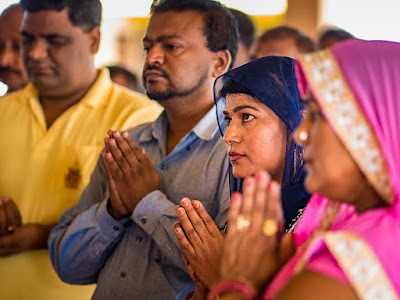 There are more photos of the short Ganesh service in my archive.